The best biotech stocks to buy today are on sale thanks to a crucial mistake on Wall Street. The industry is on the cusp of a breakout, but Wall Street traders are hunkering down and taking their money with them. Since hitting a high in late January, the iShares Nasdaq Biotechnology ETF (Nasdaq: IBB) has slumped more than 11%. That's creating a buyer's market for some of the best companies in the sector. You see, the slump in biotech stocks has little to do with their true worth. In fact, some of the best biotech stocks are currently trading well below their fundamental value, according to their earnings and assets. That means profits are sitting there for the taking for investors who know where to look. 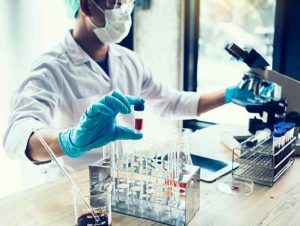 In order to help you take advantage of Wall Street's blind spot, we've identified three undervalued biotech picks with huge profit potential, including one with more that 200% growth potential. Fear over development delays, lack of consumer demand, and a war on high drug prices are all weighing on biotech stocks right now. Just look at AbbVie Inc. (NYSE: ABBV). In March, AbbVie lost 14% of its value in just two days after it announced underwhelming developments for one of its key test drugs. Despite having more than 50 drugs in development, Wall Street treated the news as a definitive deal breaker. According to Money Morning Defense and Tech Specialist Michael Robinson, we shouldn't be surprised. Despite Wall Street's pessimism, Michael argues that there are three critical factors that will drive unstoppable growth in the biotech industry. The first is the nation's aging population. Right now, there are 65 million people over the age of 70 in the United States. As this demographic continues to grow, they will require more medications – drugs that will come from the nation's biotech industry. The second is the growing rate of mergers in the industry. In 2017, biotech mergers soared 27%, reaching $332 billion in value. Bain & Co. analysts forecast that the soaring trend will extend through 2018. In just the first quarter of 2018, merger activity rose 16% year over year. Merger activity is likely to push production rates higher and raise industry profits. The third reason is drug approval speeds. The approval process of the U.S. Food & Drug Administration (FDA) has recently been streamlined, increasing the rate at which drugs are approved. That's a big plus for biotech firms. Best Biotech Stocks to Buy Today, No. 3: Shire Plc. Ireland's Shire Plc. (Nasdaq: SHPG) is a leader worldwide in medications for rare diseases and disorders. The company's ADHD treatment, Vyvanse, generated $2 billion in revenue last year. The company's hemophilia treatment brought in almost $3 billion in revenue. Angioedema treatments brought in more than $1.4 billion. Shire has 40 drugs in the pipeline, and more than half are in either phase 3 trials or in registration. Thanks to this growth, Shire beat Wall Street earnings-per-share (EPS) forecasts by 8% in the first quarter of this year. As a result, analysts are very favorable on the stock. A survey of 12 analysts indicates that the consensus price target over the next year is $197.50, a more than 18% rise from its current price of $166.45. However, Michael thinks this forecast may be conservative. As he points out, Shire is an acquisition target for Takeda Pharmaceutical Co. (OTCMKTS: TKPYY) of Japan, which is prepared to buy it for $64 billion — much higher than its current market price.